Within Teamwork Desk you can add custom fields to your "Submit a Request" form for your help docs site. Note: Only site administrators can access and update custom fields. Your contact form is linked to a specific inbox on your help doc site and if you have created any custom fields on that inbox they will appear when the customer chooses the Submit a Request option. You can create new custom fields on any inboxes you have created on your site. To have these custom fields appear on your form you will need to link the inbox to your custom form. You can do this by clicking on your profile icon to the top right of the navigation bar and select Settings. 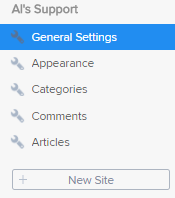 Near the top of the page select the Help Docs area of settings. Select General Settings within the left pane. To the bottom of the page you will see the Contact Form section. You will first have to enable Show Contact Form so that it will show on your help doc pages. You can then choose which inbox to send emails to from your contact form. When the customer then chooses Submit a Request then will be presented with the usual required information along with the custom fields you have created.